With warmer weather in Massachusetts and New England comes an array of outdoor activities for the whole family, including cooling off in a pool if you are lucky enough to have one. But with a pool also comes the responsibility of safety must-haves and best practices that any parent or home owner should be concerned with. 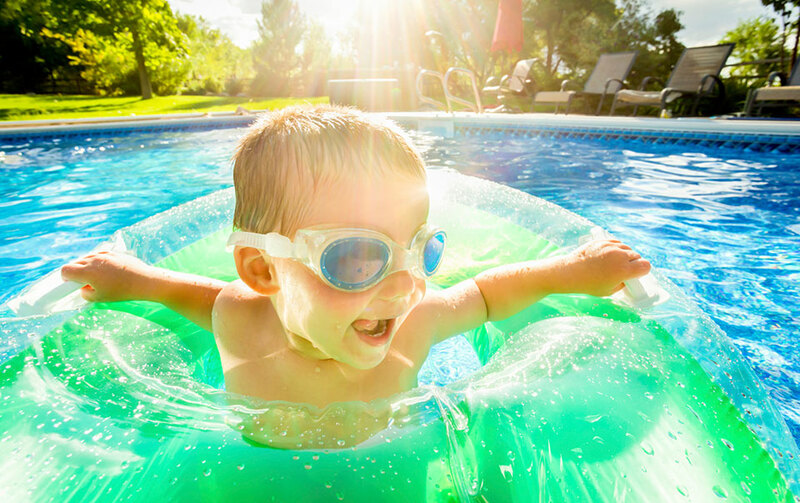 With over 200 young children drowning in backyard pools each year, these tips are critical to ensuring a fun environment for anyone who owns a pool to keep both their friends and family safe and secure. It is important to maintain secure fencing and a locked entrance around the pool and deck area to prevent access when adequate supervision is not available. Install self-closing and self-latching gates in the proper locations. Make sure no one swims alone. Never leave a child unattended in the water or pool area, and see that less experienced swimmers are always accompanied by a swimmer who has water life-saving skills. Equip your door, gate or pool with an audible alarm to alert you if someone enters the pool area or falls into the pool while it is unattended. Diving should be prohibited unless a specific area of the pool is designated for safe diving. Water depth and diving-restricted areas should be clearly marked. Make sure there is adequate life-saving equipment in the pool area, including life preservers and a rope with life-saving rings, a reaching pole or rescue hook. Keep chemicals safely stored away from the pool area. Follow all storage and usage instructions recommended by the pool chemical manufacturer. Be sure electrical devices, including outdoor entertainment systems, are away from pools or wet surfaces. When using electrical devices outdoors be sure to plug them into a GFCI (ground-fault circuit interrupter). Keep the pool area clear of glass bottles, toys or other potential accident hazards. Inspect the liner regularly as rips and tears can appear undetected at the top of the lining. Check for signs of wear and tear in areas where pipes or other items may have penetrated the liner (e.g. skimmers, hoses, etc.). For above ground pools check metal supports for rust or deterioration. These may indicate areas where the pool could rupture or a person could be injured. Check the deck for safety hazards (e.g. protruding nails, loose boards, etc.). Check the pool stair handrails and deck railing to ensure structural integrity from someone leaning or grabbing it. Ensure your pool has compliant anti-entrapment drain covers and inspect them regularly to confirm they are not broken or missing. Visit the Virginia Graeme Baker Pool and Spa Safety Act (P&SS Act) for additional information. This act applies for all outdoor and indoor structures intended for swimming or recreational bathing, including in-ground and above-ground pools, hot tubs, spas, whirlpools and non-portable wading pools.